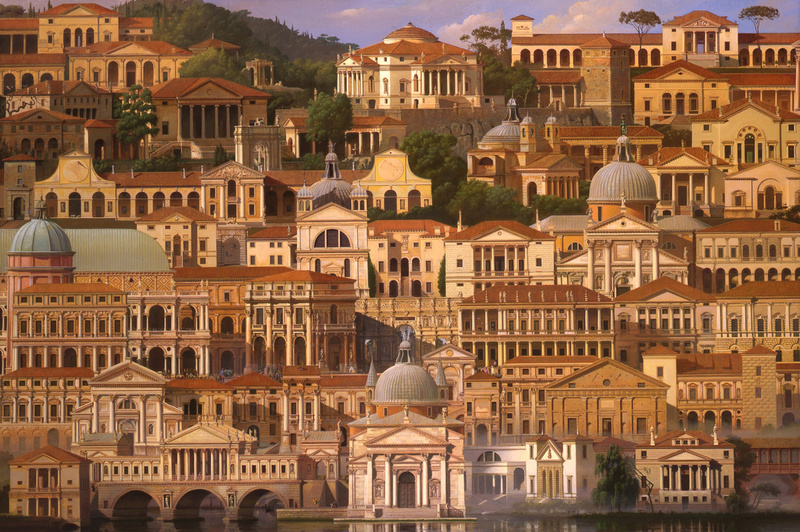 I (Carl Laubin) first became interested in Palladio when I read Colin Rowe’s essay ’The Mathematics of the Ideal Villa’, although I must confess it was the photo of Villa Rotunda on the cover that really caught my eye, and I went to Vicenza to find that view and paint it. My wife and I were totally captivated by Palladio’s architecture in Vicenza; its dignity, power, humanity and often its simplicity. 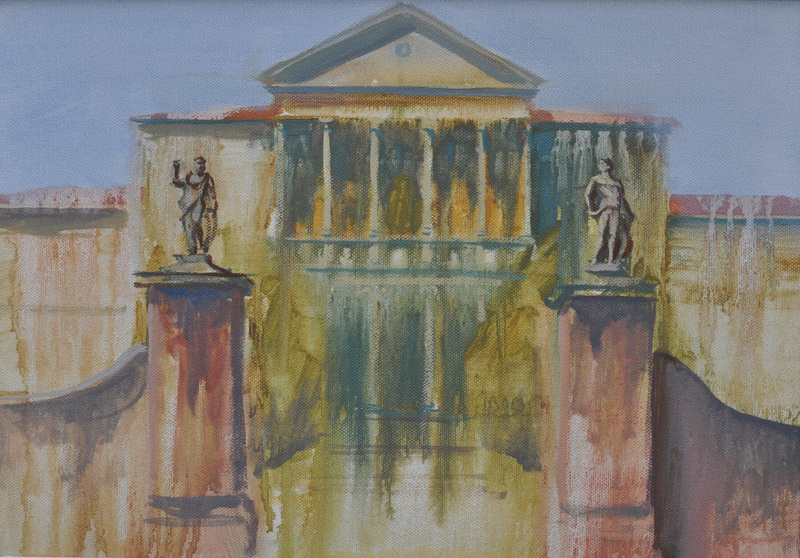 I produced at that time,1994, a capriccio of all Palladio’s buildings to a commission, Almerico to Zeno. When I realized 2008 was Palladio’s 500th anniversary, I felt I must organize an exhibition by contemporary artists celebrating his architecture, as he has been so influential in shaping our western world. But in truth, it was only in researching the painting on British Palladianism, Palladius Britannicus, that I really formed an idea of his true significance as a crucial link between the ancient and the modern world. It was not just Palladio’s buildings that influenced architecture from the 17th century onwards, significant as they were in that role, but also his study of ancient Roman ruins and writings on architecture, which he recorded in the most accessible way for following generations. The ancient world flowed through Palladio to the modern world in his writing and most importantly his drawings. Aware that there will be a number of “official” exhibitions surveying Palladio’s architecture organized for this significant anniversary, we feel it is important to have some contemporary comment on his legacy and continuing influence. We have asked a number of artists from Britain, Europe and America who have demonstrated an interest in architecture to contribute work to this exhibition. As a series of individual responses to Palladio’s rich and varied oeuvre, we hope this show will act as an interesting and significant compliment and counterpoint to the major, “official” exhibitions. Unlike an exhibition cataloguing Palladio’s output, wonderful but familiar, this exhibition’s concentration on varied artists’ reactions to his work means that one of its strengths will be, by contrast, its unpredictability. We are including, along with paintings and drawings, the work of a sculptor, a poet, an etcher, text by an art historian and an essay by a former resident of one of Palladio’s finest villas and the last to have remained, until recently, in the ownership of the family that commissioned its construction. This diversity is intended to echo the wide ranging interest in all the arts of Palladio’s Humanist patrons. Palladius Britannicus begins with some actual Palladio in the left foreground, a piece of the portico of Villa Rotunda. As one goes back into the painting, a path leads through an archway by Inigo Jones which is now in the garden at Chiswick House. Inigo Jones was the first British architect to attempt to design in a correct Italian Renaaisance style, and his references to Palladio are numerous. He not only adopted Palladian details and arrangements of building elements, but also the importance he gave to proportion in building and the interrelationship of the elements of a building. So we find several of Jones’s buildings on the right hand side of the painting – the Queen’s House at Greenwich; St. Paul’s, Covent Garden and a portion of the adjacent Piazza; the Banqueting House, Whitehall; old St Paul’s Cathedral which Jones remodelled before the Great Fire; and the Queen’s Chapel, St. James’s Palace; and the Star Chamber. After Jones, it is generally thought that Palladian influence in architecture declined during the Baroque period of Wren, Hawksmoor and Vanbrugh and was only revived again in around 1715 (Jones was early 1600’s). But I think this is wrong and several projects by those three Baroque masters show definit Palladian influences, so behind the section showing Jones’s buildings, I have included several projects by them including Wren’s Trinity Library based on Palladio’s La Carita in Venice and an early project for it based on Villa Rotunda; The Sheldonian in Oxford which uses the kind of double pediment that Palladio uses on his Venice churches; houses by Hawksmoor and Vanbrugh which use Palladian details; Blenheim Palace which has a portico taken very literally from Palladio’s Villa Trissino at Meledo as well as a covered bridge design related to a Palladian bridge design in Palladio’s Quattro Libri; and most obvious of all, the Temple of the Four Winds at Castle Howard based on Villa Rotunda. As we move to the left of this section of Baroque architects, we come into the big neo-Palladian section which was promoted by Lord Burlington through works such as Chiswick House, the York Assembly Rooms and by his followers and those encouraged by him such as Colin Campbell who wrote his own version of the Quattro Libri of British architecture, Vitruvius Britannicus. Just as Palladio’s Quattro Libri was crucial in spreading Palladio’s architecture and even more importantly his drawn reconstructions of ancient Roman architecture throughout Europe, providing a pattern book of classicism, Vitruvius Britannicus made Palladianism into the dominant style in early 18th century Britain. I have picked what I think are the most significant of these for the painting. Then, as we move further to the left, we come to later and later instances of Palladio’s continuing influence through such architects as Chambers, Cockerell and into the present day with Julian Bicknell’s version of Villa Rotunda, and several buildings by Quinlan Terry. Where Cinquecentenario had something like a Grand Canal in the middle ground, Palladius Britannicus has an English meadow. To me this has several meanings. It first represents the Roman campagna or the Forum, the sources of the ancient buildings Palladio drew in his Quattro Libri and which became the classical sources for later Palladians. 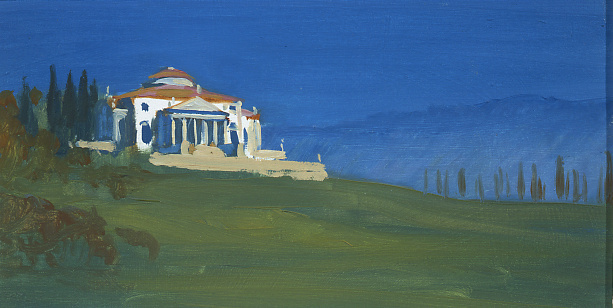 It also represents the idealized virgilian landscapes of Claude and Poussin, who were influenced by and represented Palladian architecture in their paintings and in turn influenced English Palladians to try and recreate their idealized landscape paintings in actual landscape parks, complete with temples often taken directly from the Quattro Libri, and finally my meadow turns into that unique type of park, the English landscape garden, created by Palladians in imitation of an ancient Rome documented by Palladio.